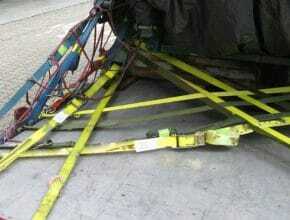 Cargo straps fall right at the bottom of the air cargo food chain, very often treated badly and used incorrectly. Yet air cargo straps are an essential component of the cargo safety story, they are used to secure large and/or heavy cargo from moving, and when an in-flight situation occurs there is no “second chance”, they have to work, 100% correctly, 100% of the time. Securing special cargo by the use of straps requires a “scientific” approach, just throwing on a few straps with a couple of extra’s for luck is not conducive to flight safety. As the National Air Cargo Flight 102 accident has highlighted, the incorrect use of straps can lead to catastrophic accidents, and if such accidents are to be avoided in future its vital that cargo straps are used correctly. The overall question that has to be considered when using a strap is “does this strap installation have sufficient strength to overcome flight loads?”. There are many factors that must be considered here, such as the type and shape of the item, the location in the aircraft, the capacity of the straps, and the angles used when attaching the strap. The ULD CARE Strap Angle APP is a job aid for checking that straps have been correctly installed. 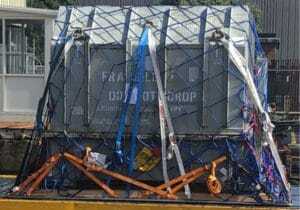 The job of calculating the number of straps and their attachment locations is for a specialist at the airline head office, NOT guess work, and those persons doing cargo build up with straps must always work according to a written strapping plan. This is where the Strap Angle APP comes into play, as it makes it possible to carry out a quick and reliable check of the angle used by each strap. CALIBRATE The first step is to calibrate the initial position and orientation of your iPhone or iPad. Calibrate by placing your iPhone or iPad flat and level next to the strap’s tie-down fitting (double stud fitting or ring), pointing the top of the phone in the aircraft’s forward direction, and tapping the red arrow button. MEASURE The second step is to measure the strap’s floor and centerline angle by moving the iPhone or iPad to the strap Place the edge of your iPhone or iPad against the strap while pointing the top of the iPhone or iPad towards the strap’s first contact point with the cargo and pointing the bottom of the phone towards the strap’s tie-down fitting. Tap the orange arrow button to lock the measurement. SHARE Tap the Share button on the app’s bottom toolbar to copy, save, text, email, AirDrop, post, or send the angle measurements. Enter the strap’s identification number if you need to keep track of different straps. REASONABILITY CHECK Before using your measured floor and centerline angles to determine strap restraint capability, you must do a reasonability check which verifies that the measurements represent reasonable angles of the strap. For example, if a strap is installed so that it looks close to straight up and down, a reasonable value for the floor angle measurement would be 80 to 90 degrees. If a strap is installed so that it looks like it extends in the forward direction along the floor, a reasonable value for the centerline angle would be from 0 to 10 degrees, and a reasonable value for the floor angle would be from 0 to 10 degrees. If either your floor angle or centerline angle measurement does not appear reasonable, then do not use the measurements and determine why there is an error. Measuring strap angles is now easy. ULD CARE has sponsored a Strap Angles app that is now available for free on the Apple App Store. An Android app is in work.